About nine hundred years ago Hazrat Shah Yousuf Gardez (RA) came riding into Multan on a lion , with alive snake for a whip and with a pair of pigeons fluttering over his head.He had ridden his lion all the way from Gardez in Afghanistan, and he had brought with him the teaching of the Twelve Imam branch of the shia sect of Islam. 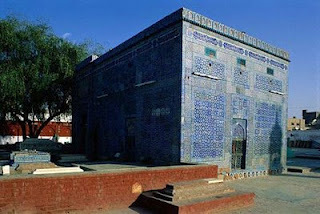 in the Multan city have shrine of Muhammad Yusaf Gardez (RA) commonly known as "Shah Gardez" just inside the Bohar Gate. It is a rectangular domeless building decorated with glazed tiles, a work of considerable beauty. He came to Multan in 1088 AD and settled here for the teaching of true Islam. The tomb is cased in blue tiles,dating from the reign of the mughal emperor humayun, and at intervels there are apertures in the tile-work ,opening into cavities specially provided to give the pigeons a lodging as close as possible to the spot where the saint's body lies. It is a pretty sight to see them poking in and out, as if if the tomb had been build solely for their benefit. The pigeons flutter here below. The kites soar there, up aloft , at what looks almost like jet-plane altitude when one lifts up one's eyes towards the sky.Since this is the Indian sub-continent, the kites do not make the pigeons their prey.They take their cue from the local human beings and leave the pigeons alone. Nine hundred years of unbroken family history, what a sheet-anchor for the fortunate Gardezis in this swiftly changing word. Arnold Joseph Toynbee ( Between Oxus & Jumna ) "Shrine to 'Shah Yousef Gardezi' who arrived in Multan from Afghanistan in 1088AD stands inside the Bohar Gate entrance to Hussein Aghai Bazaar. Its interior walls are painted with exuberant floral motifs and courtyard tombstones are covered with the exquisite blue-patterned tiles identified with Multan. The city of Multan possesses the finest collection of mausoleums. The earliest of these, the tome of Shah Yousuf Gardezi was built at(1152 A.D), with a simple rectangular shape, appears to have been an initial effort. It relies wholly on the brilliant play of colour produced by its surface ornamentation of encaustic tiles which encase of these tiles are merely painted, some are molded into a form of low relief decoration .The Shrine of Muhammad Yusaf Gardezi commonly known as Shah Gardez just inside the Bohar Gate. It is a rectangular dome less building decorated with glazed tiles, a work of considerable beauty. He came to Multan around 1088 AD and settled here for good. He is reputed to have been a gifted man of great learning who could ride tigers and handle snakes.